2008-2010 American Community Survey 3-Year Estimates. The U.S. Census Bureau released findings from the 2008-2010 American Community Survey, the most relied-upon source for up-to-date socioeconomic information every year. The release covers more than 40 topics, such as educational attainment, income, health insurance coverage, occupation, language spoken at home, nativity, ancestry and selected monthly homeowner costs. The estimates are available in detailed tables for the nation, all 50 states, the District of Columbia, Puerto Rico, every congressional district, every metropolitan area, and all counties and places with populations of 20,000 or more. American Indians and Alaska Natives in the United States Wall Map: 2010: This map shows the American Indian and Alaska Native areas reported or delineated for the 2010 Census. The map also contains related graphics that reflect 2010 Census statistics. The printed map is 48-by-36 inches with a map of the U.S. on the front and an enlargement for Alaska on the reverse side. Download the Maps. Facts for Features: American Indian and Alaska Native Heritage Month: November 2011. Population- 5.2 million. As of the 2010 Census, the nation’s population of American Indians and Alaska Natives, including those of more than one race, made up 1.7 percent of the total population. Of this total, 2.9 million were American Indian and Alaska Native only and 2.3 million were American Indian and Alaska Native in combination with one or more other races. More Young Adults are Living in Their Parents’ Home, Census Bureau Reports. Between 2005 and 2011, the proportion of young adults living in their parents’ home increased, according to the U.S. Census Bureau. The percentage of men age 25 to 34 living in the home of their parents rose from 14 percent in 2005 to 19 percent in 2011 and from 8 percent to 10 percent over the period for women. “The increase in 25 to 34 year olds living in their parents’ home began before the recent recession, and has continued beyond it,” said the author, Rose Kreider, a family demographer with the Fertility and Family Statistics Branch. Good grief!!! Grow up and move out already! The Foreign-Born with Science and Engineering Degrees: 2010. Foreign-born residents represented 33 percent of all bachelor’s degree holders in engineering fields, 27 percent in computers, mathematics and statistics; 24 percent in physical sciences; and 17 percent in biological, agricultural and environmental sciences. Of the 4.2 million foreign-born science and engineering bachelor’s degree holders in the U.S., 57 percent were born in Asia, 18 percent in Europe, 16 percent in Latin America and the Caribbean, 5 percent in Africa. The majority (64 percent) of foreign-born residents with degrees in computers, mathematics and statistics were born in Asia, including 24 percent who were born in India and 14 percent who were born in China. Census Bureau Releases Comprehensive Analysis of Fast-Growing 90-and-Older Population. The nation’s 90-and-older population nearly tripled over the past three decades, reaching 1.9 million in 2010, according to a report released today by the U.S. Census Bureau and supported by the National Institute on Aging. Over the next four decades, this population is projected to more than quadruple. Because of increases in life expectancy at older ages, people 90 and older now comprise 4.7 percent of the older population (age 65 and older), as compared with only 2.8 percent in 1980. By 2050, this share is likely to reach 10 percent. From WITA: Official Launch of Export Now on 14-Nov-11 12:00 PM. Now is the simplest, least expensive channel for U.S. companies expanding in the booming Chinese market. Export Now’s innovative technology and logistics platform offers a turnkey solution for selling in China. Visit the NEW Export Now Website. Also from WITA(AP feed): “Missouri reaches $4.4B trade agreement with China”. Missouri Gov. Jay Nixon said Monday the state has reached an agreement to sell $4.4 billion worth of products to China for the next three years starting in 2012. Nixon said the deal between the state Department of Economic Development and the China Council for the Promotion of International Trade emphasizes agricultural products and would boost Missouri exports to China by more than $1 billion over three years. The Democratic governor said international trade is important for improving Missouri’s economy. From ICTSD: China-Africa economic cooperation zones: Political and economic implications. Over the last decade, China’s economic engagement with Africa has grown exponentially. Trade between China and Africa reached $129 billion in 2010. 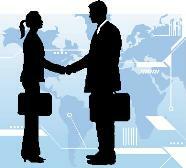 New models of bilateral cooperation have emerged. Among others, China’s Ministry of Commerce (MOFCOM) is supporting the development of six official economic and trade cooperation zones in five African countries. While all of these zones are still at an early stage of development, we provide here an initial analysis of their political and economic implications. Read more. 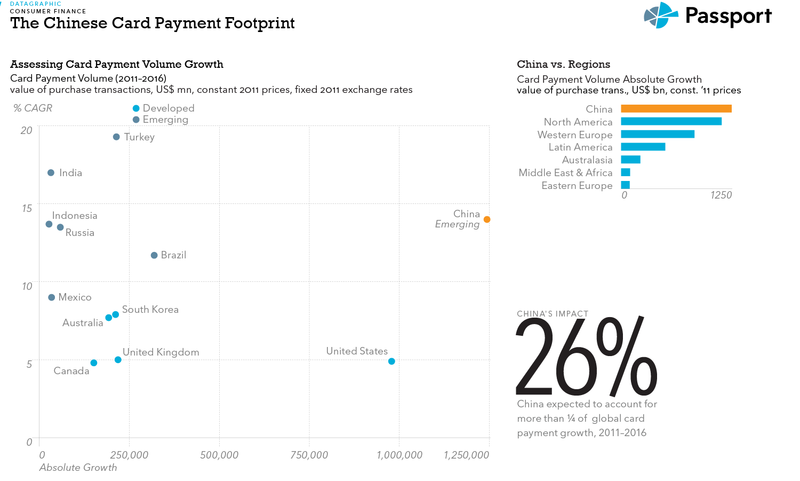 From EuroMonitor: The Chinese Card Payment Footprint. China is expected to account for over 1/4 of the entire global credit card payment growth! This accompanying video explains further. Three Trends Driving Card Payment Growth in China. Urbanization is one of the major themes underlying card payment growth in the world, states Jonathan Fisher, Head of Consumer Finance Research at Euromonitor. China presents itself differently than other emerging markets, notably that its major cities such as Beijing and Shanghai are actually decreasing in population. China’s consumers also tend to save more than consumers in other emerging markets, converting roughly 57-60% of all income into expenditure and saving the rest. From Silk Road Intl. Show follow up, next steps in China. People often ask me about service providers in China that they could use once they were back home. The reality is that even if you’re multi-talented (quite possible), flush with cash (doubtful in today’s economy) and have tons of extra time on your hands (not likely) you’re going to need some help from people that have both experience and are on the ground in China. Also from the Silk Road: Location, location, location and other suggestions for selecting the best supplier. Location counts—Sure the price may be better, but you need to factor in how long people have been doing business both in that factory and in that area (sub suppliers). The rule of thumb is this: the most advanced suppliers are found in HK/Taiwan, then Guandong, then other East Coast cities, then the rest of China. From China Sourcing Blog: Map: China’s Top 100 Industrial Clusters. 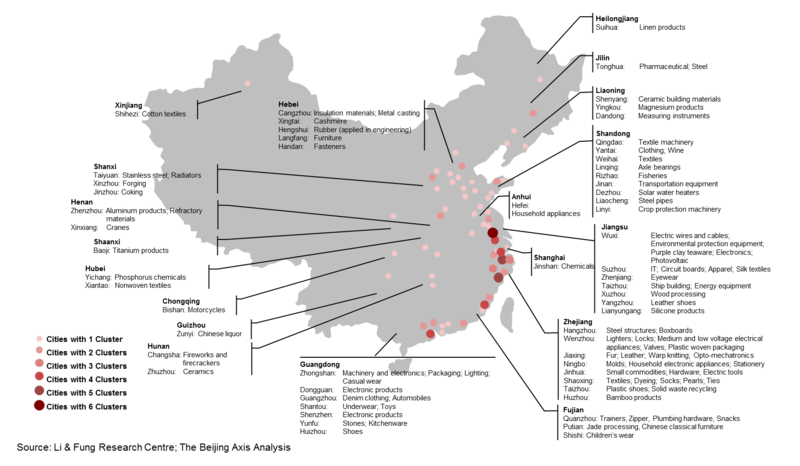 The map below illustrates the concentration of industry in China, using cities to identify locations where resources and competencies have been concentrated to produce a competitive advantage in a specific industry. This map provides an interesting perspective on what is made where in China. Some of the cities listed on this map have become famous for their particular industrial cluster. Just a few examples of which are: bra’s and ladies underwear in Shantou (Guangdong); electronic products in Dongguan (Guangdong); transport equipment in Shandong; and lighters in Wenzhou (Zhejiang). The clusters are predominantly still located in the eastern part of the country, but as the distribution of the dots on the map illustrates, there is a lot going on in many provinces not only in the coastal areas. From ICTSD: Rare Earths: Largest Chinese Producer Shuts Off Production for a Month. While the WTO has been quiet as of late on the contentious rare earths front, trade in the precious materials has been shaken quite a bit over the past months. The global rare earths market has recently experienced massive upheaval with prices falling sharply in June 2011. In response, China’s largest rare-earth producer, Inner Mongolia Batou, announced last week that it would be halting production for four weeks’ time. Rare earths are needed in essentially every area of high-tech production, be it for pharmaceuticals, military equipment, green energy technology, or information technologies. The 25 percent price drop since June is the result of a series of factors. Since 2008, rare earth prices rose from US$ 10 per kilogramme (for a basket of rare earths) to over US$ 200 in early 2011. Prices increased only after China started imposing export quotas for the precious materials. 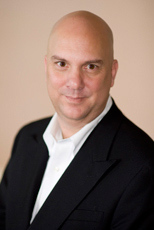 From Trade Alert: China: Evidence for the manipulation of rare earth prices. In October 2011, numerous and consistent press articles reported on two incidences of potential price manipulation in Chinese rare earths exports. On 18 October 2011, the largest Chinese rare earth mining company Baotou announced a halt to its production. The company said it would pause production for a month “balancing supply and demand.” Baotou’s share in Chinese rare earth extraction is estimated to lie around 40 percent. A collection of related news articles are also listed. From Global Sources: In China, make no assumptions. So, what are these assumptions that Westerners tend to make and that can hurt them badly when they purchase from China? The short answer is: they are used to purchasing products on a catalogue, agreeing on a price, deciding on a quantity, and arranging payment. Do that in China and you’ll run a 30% chance of losing the entire order! From European Commission on Trade: New EU study shows significant economic benefits from a Doha deal. A recent study shows that the economic benefits arising from the Doha Development Agenda (DDA) negotiations in the World Trade Organisation amount to an increase of world exports of $359 billion on an annual basis from a deal on the liberalisation of industrial goods, agriculture, services and on the removal of red tape. If an agreement on sectoral liberalisation of industrial goods (chemicals, machinery, electronics) could be reached, world exports would increase by a further $146 billion, totalling $505 billion annually. Read more. From Euromonitor: The Power of Proximity – the Complex Story of 21st Century Cities: For the first time ever, over half of the global population lives in cities, a number expected to reach 60-80% by 2050. While much of the urbanisation of the previous two decades has been in the Asia Pacific region, the next wave of urbanisation is expected to be in Africa and the Middle East. Euromonitor International’s latest report, The Power of Proximity – the Complex Story of 21st Century Cities, examines the rise of megacities (with over 10 million inhabitants), and characterises mature, rising and emerging cities. Also considered are the relationships between cities and digital technology and culture, as well those between cities and inequality and political instability. From ITCSD: Two steps forward, one step back: LDCs and the challenges of South-South trade in times of ‘Shifting Wealth’. Despite the pessimism that reigns in many high-income economies since the financial meltdown of 2008-2009, for most of the developing world the outlook is much rosier. 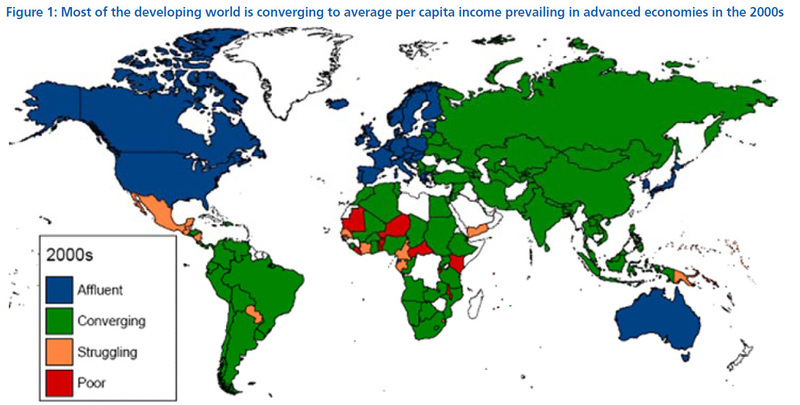 In a dramatic turnaround in their fortunes after the debt-crisis of the 1980s and the financial turmoil of the 1990s, for the first time in many decades emerging and developing countries are now converging to per capita income prevailing in advanced economies. In the 2000s, as many as 88 emerging and developing economies were growing at least twice as fast as advanced economies. From Global Edge: Social Media Potential in the Middle East. While social media sites are becoming increasingly popular worldwide, there is one region in particular where social media has nearly unlimited growth potential. That region is the Middle East and although there has been much concern surrounding the use of social networks for protest demonstrations, social media sites provide great opportunities for businesses of the region. In the Middle East the number of social media users has already doubled in the past year. Now, the question is whether businesses of the region will take advantage of social networks and use them as a brand building tool.